The scanner is connected to the supplied power cable and connected via USB cable to the PC. Then you have to install the included software Cyberview and clamp the roll of film onto the scanner. Ready to go. The film will be transported automatically and initially scanned frame by frame. Based on the software you can create the film (18 frames/s + 24 frames/s) and save the file as AVI format. The sales pitch above is from the reflecta website. 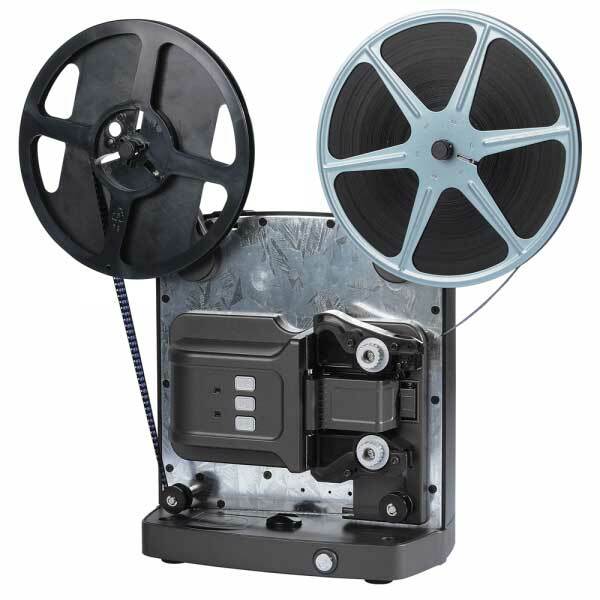 This super 8 only scanner is a reworked projector for frame by frame scanning. Reflecta super 8 scanner video. I would like to emphasise that I haven’t actually had any hands on experience with the Reflecta super 8 film scanner. But with reported problems which Include frame skipping, It would appear that the machine needs some further development by Reflector. Before it becomes a reliable Reflecta super 8 film scanner. In the mean time I will be staying with our very reliable and superb Tobin sprocket less super 8 film scanners. Reflecta super 8 scanner technicial.